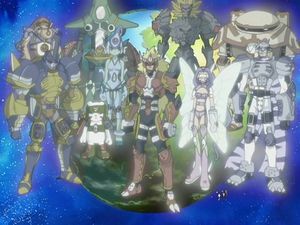 The Legendary Spirits 「伝説のスピリット Densetsu no Supiritto」, also known as Legendary Digital Spirits, Legendary DigiSpirits and Battle Spirits, are used in Digimon Frontier to spirit evolve humans into Hybrid Digimon. Or in some cases the spirits themselves turn into Hybrid Digimon. They were created from the Legendary Warrior Ten after their battle with Lucemon. Each Spirit resembles the stored armor or body of the Hybrid Digimon that they create, and the word "SPIRIT" ( ) is inscribed in Digimoji several times around their base. Each spirit also has a symbol associated to it, which is just a stylized kanji character referring to the spirit's main attribute. Susanoomon bears an eleventh symbol, stylized after the kanji for "heaven" (天 ten). Kanbara Takuya obtains the Human Spirit of Fire in DF01, scans the Beast Spirit of Fire from Shamamon in DF11, takes the Beast Spirit of Earth from Gigasmon in DF12, scans the Human Spirit of Steel from Mercuremon in DF28 and scans the Beast Spirit of Steel from Sephirothmon in DF29. Minamoto Kouji obtains the Human Spirit of Light in DF02 and the Beast Spirit of Light in DF10, scans the Beast Spirit of Wood from Petaldramon in DF20 and scans the Human Spirit of Wood, Corrupted Human Spirit of Darkness and Corrupted Beast Spirit of Darkness from Duskmon and Velgmon in DF32. Himi Tomoki obtains the Human Spirit of Ice in DF03 before being taken by Gigasmon in DF11 and recovered in DF12 and is given the Beast Spirit of Ice by Nanomon in DF17. Orimoto Izumi obtains the Human Spirit of Wind in DF04 before being taken by Gigasmon in DF10 and recovered in DF14 and finds the Beast Spirit of Wind underwater in DF16. Shibayama Junpei obtains the Human Spirit of Thunder in DF05 and the Beast Spirit of Thunder in DF14, which he uses to defeat and scan Grottemon, along with the Human Spirit of Earth. Kimura Kouichi is given the Corrupted Human Spirit of Darkness and Corrupted Beast Spirit of Darkness by Cherubimon, sealing the latter until DF30. After being scanned, he receives the purified Human Spirit of Darkness and Beast Spirit of Darkness in DF33 from Kouji's digivice and later gives them back in DF48 via sacrifice. Cherubimon is the owner of the spirits of Earth, Water (Human Spirit only), Wood, Steel and Darkness, turning the first four into the respective human-type Digimon and gives the spirits of Darkness to Kimura Kouichi. Seraphimon is the owner of the spirits of Wind and Light and Ophanimon is the owner of the spirits of Fire, Ice and Lightning, which are all hidden from Cherubimon. 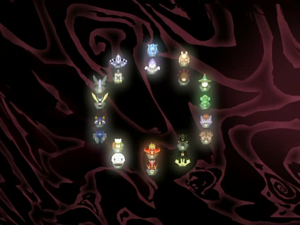 At the end of DF50, all spirits turn into the respective Digimon. This page was last modified on 11 December 2018, at 10:18.